This tiny village holds the remains of an abbey which was built by Augustinian monks in the 13th century. 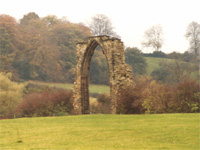 All that still stands today is a 40ft high chancel window in a field. You can also find the diminutive All Saint’s Church which is possibly one of the smallest in the country.